Local REALTORS® deliver the goods with Annual Fundraiser! As part of of their 10th Annual Food Drive and Turkey Fundraiser, members of the Kingston and Area Real Estate Association worked together this holiday season to raise money for area food banks. Kingston and Napanee Area REALTORS® donated a total of $3,595 which purchased 245 turkeys that were distributed to the Partners in Mission Food Bank and local charities, along with a $500 cash donation. Busy as well were Gananoque Area REALTORS® who raised an additonal $3,400 for the Food Bank! A special thanks to Chris and Staff from Freshco on the turkey purchase and loading! 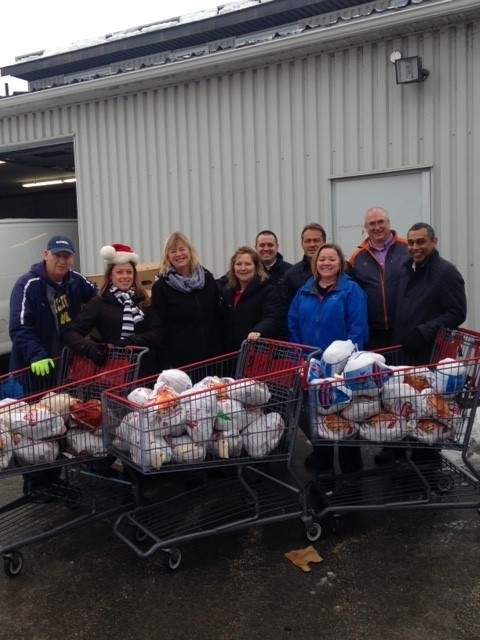 Photo: Delivery of over 200 turkeys to Partners in Mission Food Bank by KAREA members - Thursday, December 22/16. (Left to right: Tony Mader -Partners in Mission Food Bank, Lisa Salamone, Kim Donaldson, Colleen Emmerson, Ted Lewis, Steve van Wynsberghe, Liza Tallen, John MacIntyre, Randy Gill).